Mik was interested in The Seas with Nemo & Friends ride because it is actually wheelchair accessible unlike the sub ride at Disneyland (makes total sense why this is not accessible and many think the alternate experience is better). 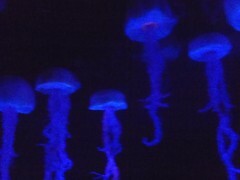 The clams for the Nemo ride reminded us of the new Little Mermaid ride at California Adventure. However, instead of Triton's chariot, the wheelchair vehicle is just a giant clam. 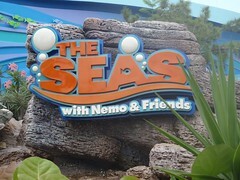 Overall we enjoyed the Nemo & Friends ride, but we were surprised how long we had to wait for the clam to come around. 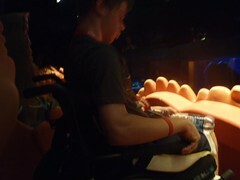 The ride was basically a walk on, but it felt like 15 minutes before the wheelchair clam finally came around. They do at least have an okay area you can wait in so the line can go past you as you wait. 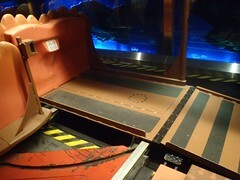 To get in the clam they slow the walkway, pull out the platform, and fold out the vehicles ramp. The CM loaded Mik on, as they have the companion get in first. It is actually pretty cool, as they just push the chair straight up onto the platform, then put the ramp back up and turn the platform back into the clam. Like The Little Mermaid ride and the Disney World's Buzz Lightyear ride they are usually able to do this without having to stop the ride. The ride reminded me a lot of the sub ride, but is actually better. Now that we have done this ride, Mik does not feel like he is totally missing out on the sub ride anymore, although I still keep trying to convince him to try the alternate experience for that one.